The ironbound door at the end of the narrow passageway creaked open. An ancient man peered out and focused wrinkle-lapped eyes on Keff. Keff knew what the old one saw: a mature man, not overly tall, whose wavy brown hair, only just beginning to be shot with gray, was arrayed above a mild yet bull-like brow and deep-set blue eyes. A nose whose craggy shape suggested it may or may not have been broken at some time in the past, and a mouth framed by humor lines added to the impression of one who was tough yet instinctively gentle. He was dressed in a simple tunic but carried a sword at his side with the easy air of someone who knew how to use it. The oldster wore the shapeless garments of one who has ceased to care for any attribute but warmth and convenience. They studied each other for a moment. Keff dipped his head slightly in greeting. "I have no master. Get ye gone to whence ye came," the ancient spat, eyes blazing. Keff knew at once that this was no serving man; he'd just insulted the High Wizard Zarelb himself! He straightened his shoulders, going on guard but seeking to look friendly and non-threatening. "Nay, sir," Keff said. "I must speak to you." Rats crept out of the doorway only inches from his feet and skittered away through the gutters along the walls. A disgusting place, but Keff had his mission to think of. "Get ye gone," the old man repeated. "I've nothing for you." He tried to close the heavy, planked door. Keff pushed his gauntleted forearm into the narrowing crack and held it open. The old man backed away a pace, his eyes showing fear. "I know you have the Scroll of Almon," Keff said, keeping his voice gentle. "I need it, good sir, to save the people of Harimm. Please give it to me, sir. I will harm you not." "Very well, young man," the wizard said. "Since you threaten me, I will cede the scroll." Keff relaxed slightly, with an inward grin. Then he caught a gleam in the old man's eye, which focused over Keff's shoulder. Spinning on his heel, Keff whipped his narrow sword out of its scabbard. Its lighted point picked out glints in the eyes and off the sword-blades of the three ruffians who had stepped into the street behind him. He was trapped. One of the ruffians showed blackened stumps of teeth in a broad grin. "Going somewhere, sonny?" he asked. His sword on high, the ruffian charged. Keff immediately blocked the man's chop, and riposted, flinging the man's heavy sword away with a clever twist of his slender blade that left the man's chest unguarded and vulnerable. He lunged, seeking his enemy's heart with his blade. Stumbling away with more haste than grace, the man spat, gathered himself, and charged again, this time followed by the other two. Keff turned into a whirlwind, parrying, thrusting, and striking, holding the three men at bay. A near strike by one of his opponents streaked along the wall by his cheek. He jumped away and parried just before an enemy skewered him. "Yoicks!" he cried, dancing in again. "Have at you!" He lunged, and the hot point of his epee struck the middle of the chief thug's chest. The body sank to the ground, and vanished. "There!" Keff shouted, flicking the sword back and forth, leaving a Z etched in white light on the air. "You are not invincible. Surrender or die!" Keff's renewed energy seemed to confuse the two remaining ruffians, who fought disjointedly, sometimes getting in each other's way while Keff's blade found its mark again and again, sinking its light into arms, shoulders, chests. In a lightning-fast sequence, first one, then the other foe left his guard open a moment too long. With groans, the villains sank to the ground, whereupon they too vanished. Putting the epee back into his belt, Keff turned to confront the ancient wizard, who stood watching the proceedings with a neutral eye. "Nay, nay." The old man fumbled in the battered leather scrip at his side. From it he took a roll of parchment, yellowed and crackling with age. Keff stared at it with awe. He bowed to the wizard, who gave him a grudging look of respect. The scroll lifted out of the wizard's hand and floated toward Keff. Hovering in the air, it unrolled slowly. Keff squinted at what was revealed within: spidery tracings in fading brown ink, depicting mountains, roads, and rivers. "A map!" he breathed. "Hold it," the wizard said, his voice unaccountably changing from a cracked baritone to a pleasant female alto. "We're in range of the comsats." Door, rats, and aged figure vanished, leaving blank walls. "Oh, spacedust," Keff said, unstrapping his belt and laser epee and throwing himself into the crash seat at the control console. "I was enjoying that. Whew! Good workout!" He pulled his sweaty tunic off over his head, and mopped his face with the tails. The dark curls of hair on his broad chest may have been shot through here and there with white ones, but he was grinning like a boy. "You nearly got yourself spitted back there," said the disembodied voice of Carialle, simultaneously sending and acknowledging ID signals to the SSS-900. "Watch your back better next time." "What'd I get for that?" Keff asked. "No points for unfinished tasks. Maps are always unknowns. You'll have to follow it and see," Carialle said coyly. The image of a gorgeous lady dressed in floating sky blue chiffon and gauze and a pointed hennin appeared briefly on a screen next to her titanium column. The lovely rose-and-cream complected visage smiled down on Keff. "Nice footwork, good sir knight," the Lady Fair said, and vanished. "SSS-900, this is the CK-963 requesting permission to approach and dockHello, Simeon!" "Carialle!" The voice of the station controller came through the box. "Welcome back! Permission granted, babe. And that's SSS-900-C, now, C for Channa. A lot's happened in the year since you've been away. Keff, are you there?" Keff leaned in toward the pickup. "Right here, Simeon. We're within half a billion klicks. Should be with you soon." "It'll be good to have you on board," Simeon said. "We're a little disarrayed right now, to put it mildly, but you didn't come to see me for my housekeeping." "No, cookie, but you give such good decontam a girl can hardly stay away," Carialle quipped with a naughty chuckle. "Dragon's teeth, Simeon!" Keff suddenly exclaimed, staring at his scopes. "What happened around here?" "Well, if you really want to know . . ."
The scout ship threaded its way through an increasingly cluttered maze of junk and debris as they neared the rotating dumbbell shape of Station SSS-900. After viewing Keff's cause for alarm, Carialle put her repulsors on full to avoid the very real possibility of intersecting with one of the floating chunks of metal debris that shared a Trojan point with the station. Skiffs and tugs moved amidst the shattered parts of ships and satellites, scavenging. A pair of battered tugs with scoops on the front, looking ridiculously like gigantic vacuum cleaners, described regular rows as they sieved up microfine spacedust that could hole hulls and vanes of passing ships without ever being detected by the crews inside. The cleanup tugs sent hails as Carialle passed them in a smooth arc, synchronizing herself to the spin of the space station. The north docking ring was being repaired, so with a flick of her controls, Carialle increased thrust and caught up with the south end. Lights began to chase around the lip of one of the docking bays on the ring, and she made for it.
" . . . so that was the last we saw of the pirate Belazir and his bully boys," Simeon finished, sounding weary. "For good, I hope. My shell has been put in a more damage resistant casing and resealed in its pillar. We've spent the last six months healing and picking up the pieces. Still waiting for replacement parts. The insurance company is being sticky and querying every fardling item on the list, but no one's surprised about that. Fleet ships are remaining in the area. We've put in for a permanent patrol, maybe a small garrison." "You have had a hell of a time," Carialle said, sympathetically. "Now let's hear the good news," Simeon said, with a sudden surge of energy in his voice. "Where've you been all this time?" Carialle simulated a trumpet playing a fanfare. "We're pleased to announce that star GZA-906-M has two planets with oxygen-breathing life," Keff said. "Congratulations, you two!" Simeon said, sending an audio burst that sounded like thousands of people cheering. He paused, very briefly. "I'm sending a simultaneous message to Xeno and Explorations. They're standing by for a full report with samples and graphs, but me first! I want to hear it all." 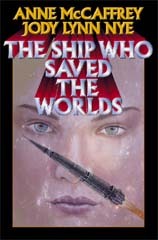 Carialle accessed her library files and tight-beamed the star chart and xeno file to Simeon's personal receiving frequency. "This is a precis of what we'll give to Xeno and the benchmarkers," she said. "We'll spare you the boring stuff." "If there's any bad news," Keff began, "it's that there's no sentient life on planet four, and planet three's is too far down the tech scale to join Central Worlds as a trading partner. But they were glad to see us." "He thinks," Carialle interrupted, with a snort. "I really never knew what the Beasts Blatisant thought." Keff shot an exasperated glance at her pillar, which she ignored. She clicked through the directory on the file and brought up the profile on the natives of Iricon III. "Why do you call them the Beasts Blatisant?" Simeon asked, scanning the video of the skinny, hairy hexapedal beings, whose faces resembled those of intelligent grasshoppers. "Listen to the audio," Carialle said, laughing. "They use a complex form of communication which we have a sociological aversion to understanding. Keff thought I was blowing smoke, so to speak." "That's not true, Cari," Keff protested. "My initial conclusion," he stressed to Simeon, "was that they had no need for a complex spoken language. They live right in the swamps," Keff said, narrating the video that played off the datahedron. "As you can see, they travel either on all sixes or upright on four with two manipulative limbs. There are numerous predators that eat Beasts, among other things, and the simple spoken language is sufficient to relay information about them. Maintaining life is simple. You can see that fruit and edible vegetables grow in abundance right there in the swamp. The overlay shows which plants are dangerous." "Not too many," Simeon said, noting the international symbols for poisonous and toxic compounds: a skull and crossbones and a small round face with its tongue out. "Of course the first berry tried by my knight errant, and I especially stress the errant," Carialle said, "was those raspberry red ones on the left, marked with Mr. Yucky Face." "Well, the natives were eating them, and their biology isn't that unlike Terran reptiles." Keff grimaced as he admitted, "but the berries gave me fierce stomach cramps. I was rolling all over the place clutching my belly. The Beasts thought it was funny." The video duly showed the hexapods, hooting, standing over a prone and writhing Keff. "It was, a little," Carialle added, "once I got over being worried that he hadn't eaten something lethal. I told him to wait for the full analysis"
"That would have taken hours," Keff interjected. "Our social interaction was happening in realtime." "Well, you certainly made an impression." "Did you understand the Beasts Blatisant? How'd the IT program go?" asked Simeon, changing the subject. IT stood for Intentional Translator, the universal simultaneous language translation program that Keff had started before he graduated from school. IT was in a constant state of being perfected, adding referents and standards from each new alien language recorded by Central Worlds exploration teams. The brawn had more faith in his invention than his brain partner, who never relied on IT more than necessary. Carialle teased Keff mightily over the mistakes the IT made, but all the chaffing was affectionately meant. Brain and brawn had been together fourteen years out of a twenty-five-year mission, and were close and caring friends. For all the badinage she tossed his way, Carialle never let anyone else take the mickey out of her partner within her hearing. Now she sniffed. "Still flawed, since IT uses only the symbology of alien life-forms already discovered. Even with the addition of the Blaize Modification for sign language, I think that it still fails to anticipate. I mean, who the hell knows what referents and standards new alien races will use?" "Sustained use of a symbol in context suggests that it has meaning," Keff argued. "That's the basis of the program." "How do you tell the difference between a repeated movement with meaning and one without?" Carialle asked, reviving the old argument. "Supposing a jellyfish's wiggle is sometimes for propulsion and sometimes for dissemination of information? Listen, Simeon, you be the judge." "All right," the station manager said, amused. "What if members of a new race have mouths and talk, but impart any information of real importance in some other way? Say, with a couple of sharp poots out the sphincter?" "It was the berries," Keff said. "Their diet caused the repeating, er, repeats." "Maybe that . . . habit . . . had some relevance in the beginning of their civilization," Carialle said with acerbity. "However, Simeon, once Keff got the translator working on their verbal language, we found that at first they just parroted back to him anything he said, like a primitive AI pattern, gradually forming sentences, using words of their own and anything they heard him say. It seemed useful at first. We thought they'd learn Standard at light-speed, long before Keff could pick up on the intricacies of their language, but that wasn't what happened." "They parroted the language right, but they didn't really understand what I was saying," Keff said, alternating his narrative automatically with Carialle's. "No true comprehension." "In the meantime, the flatulence was bothering him, not only because it seemed to be ubiquitous, but because it seemed to be controllable." "I didn't know if it was supposed to annoy me, or if it meant something. Then we started studying them more closely." The video cut from one scene to another of the skinny, hairy aliens diving for ichthyoids and eels, which they captured with their middle pair of limbs. More footage showed them eating voraciously; teaching their young to hunt; questing for smaller food animals and hiding from larger and more dangerous beasties. Not much of the land was dry, and what vegetation grew there was sought after by all the hungry species. Early tapes showed that, at first, the Beasts seemed to be afraid of Keff, behaving as if they thought he was going to attack them. Over the course of a few days, as he seemed to be neither aggressive nor helpless, they investigated him further. When they dined, he ate a meal from his own supplies beside them. "Then, keeping my distance, I started asking them questions, putting a clear rising interrogative into my tone of voice that I had heard their young use when asking for instruction. That seemed to please them, even though they were puzzled why an obviously mature being needed what seemed to be survival information. Interspecies communication and cooperation was unknown to them." Keff watched as Carialle skipped through the data to another event. "This was the potlatch. Before it really got started, the Beasts ate kilos of those bean-berries." "Keff had decided then that they couldn't be too intelligent, doing something like that to themselves. Eating foods that caused them obvious distress for pure ceremony's sake seemed downright dumb." "I was disappointed. Then the IT started kicking back patterns to me on the Beasts' noises. Then I felt downright dumb." Keff had the good grace to grin at himself. Keff grinned sheepishly. "Oh, Carialle was right, of course. The red berries were the key to their formal communication. I had to give points for repetition of, er, body language. So, I programmed the IT to pick up what the Blatisants meant, not just what they said, taking in all movement or sounds to analyze for meaning. It didn't always work right . . ."
"Hah!" Carialle interrupted, in triumph. "He admits it!" " . . . but soon, I was getting the sense of what they were really communicating. The verbal was little more than protective coloration. The Blatisants do have a natural gift for mimicry. The IT worked finewell, mostly. The system's just going to require more testing, that's all." "It always requires more testing," Carialle remarked in a long-suffering voice. "One day we're going to miss something we really need." Keff was unperturbed. "Maybe IT needs an AI element to test each set of physical movements or gestures for meaning on the spot and relay it to the running glossary. I'm going to use IT on humans next, see if I can refine the quirks that way when I already know what a being is communicating." "If it works," Simeon said, with rising interest, "and you can read body language, it'll put you far beyond any means of translation that's ever been done. They'll call you a mind-reader. Softshells so seldom say what they meanbut they do express it through their attitudes and gestures. I can think of a thousand practical uses for IT right here in Central Worlds." "As for the Blatisants, there's no reason not to recommend further investigation to award them ISS status, since it's clear they are sentient and have an ongoing civilization, however primitive," Keff said. "And that's what I'm going to tell the Central Committee in my report. Iricon III's got to go on the list." "I wish I could be a mouse in the wall," Simeon said, chuckling with mischievous glee, "when an evaluation team has to talk with your Beasts. The whole party's going to sound like a raft of untuned engines. I know CenCom's going to be happy to hear about another race of sentients." "I know," Keff said, a little sadly, "but it's not the race, you know." To Keff and Carialle, the designation meant that most elusive of holy grails, an alien race culturally and technologically advanced enough to meet humanity on its own terms, having independently achieved computer science and space travel. "If anyone's going to find the race, it's likely to be you two," Simeon said with open sincerity. Carialle closed the last kilometers to the docking bay and shut off her engines as the magnetic grapples pulled her close, and the vacuum seal snugged around the airlock. The lights on the board started flashing as Simeon sent a burst requesting decontamination for the CK-963. Keff pushed back from the monitor panels and went back to his cabin to make certain everything personal was locked down before the decontam crew came on board. "We're empty on everything, Simeon," Carialle said. "Protein vats are at the low ebb, my nutrients are redlining, fuel cells down. Fill 'er up." "We're a bit short on some supplies at the moment," Simeon said, "but I'll give you what I can." There was a brief pause, and his voice returned. "I've checked for mail. Keff has two parcels. The manifests are for circuits, and for a 'Rotoflex.' What's that?" "Hah!" said Keff, pleased. "Exercise equipment. A Rotoflex helps build chest and back muscles without strain on the intercostals." He flattened his hands over his ribs and breathed deeply to demonstrate. "All we need is more clang-and-bump deadware on my deck," Carialle said with the noise that served her for a sigh. "Where's your shipment, Carialle?" Keff asked innocently. "I thought you were sending for a body from Moto-Prosthetics." "Well, you thought wrong," Carialle said, exasperated that he was bringing up their old argument. "I'm happy in my skin, thank you." "You'd love being mobile, lady fair," Keff said. "All the things you miss staying in one place! You can't imagine. Tell her, Simeon." "She travels more than I do, Sir Galahad. Forget it." "Anyone else have messages for us?" Carialle asked. "Not that I have on record, but I'll put out a query to show you're in dock." Keff picked his sodden tunic off the console and stood up. "I'd better go and let the medicals have their poke at me," he said. "Will you take care of the rest of the computer debriefing, my lady Cari, or do you want me to stay and make sure they don't poke in anywhere you don't want them?" "Nay, good sir knight," Carialle responded, still playing the game. "You have coursed long and far, and deserve reward." "The only rewards I want," Keff said wistfully, "are a beer that hasn't been frozen for a year, and a little companionshipnot that you aren't the perfect companion, lady fair"he kissed his hand to the titanium column"but as the prophet said, let there be spaces in your togetherness. If you'll excuse me?" "Well, don't space yourself too far," Carialle said. Keff grinned. Carialle followed him on her internal cameras to his cabin, where, in deference to those spaces he mentioned, she stopped. She heard the sonic-shower turn on and off, and the hiss of his closet door. He came out of the cabin pulling on a new, dry tunic, his curly hair tousled. "Ta-ta," Keff said. "I go to confess all and slay a beer or two." Before the airlock sealed, Carialle had opened up her public memory banks to Simeon, transferring full copies of their datafiles on the Iricon mission. Xeno were on line in seconds, asking her for in-depth, eyewitness commentary on their exploration. Keff, in Medical, was probably answering some of the same questions. Xeno liked subjective accounts as well as mechanical recordings. At the same time Carialle carried on her conversation with Simeon, she oversaw the decontam crew and loading staff, and relaxed a little herself after what had been an arduous journey. A few days here, and she'd feel ready to go out and knit the galactic spiral into a sweater. Keff's medical examination, under the capable stethoscope of Dr. Chaundra, took less than fifteen minutes, but the interview with Xeno went on for hours. By the time he had recited from memory everything he thought or observed about the Beasts Blatisant he was wrung out and dry. "You know, Keff," Darvi, the xenologist, said, shutting down his clipboard terminal on the Beast Blatisant file, "if I didn't know you personally, I'd have to think you were a little nuts, giving alien races silly names like that. Beasts Blatisant. Sea Nymphs. Loselsthat was the last one I remember." "Don't you ever play Myths and Legends, Darvi?" Keff asked, eyes innocent. "Not in years. Its a kid game, isn't it?" "No! Nothing wrong with my mind, nyuk-nyuk," Keff said, rubbing knuckles on his own pate and pulling a face. The xenologist looked worried for a moment, then relaxed as he realized Keff was teasing him. "Seriously, it's self-defense against boredom. After fourteen years of this job, one gets fardling tired of referring to a species as 'the indigenous race' or 'the inhabitants of Zoocon I.' I'm not an AI drone, and neither is Carialle." "Well, the names are still silly." "Humankind is a silly race," Keff said lightly. "I'm just indulging in innocent fun." He didn't want to get into what he and Carialle considered the serious aspects of the game, the points of honor, the satisfaction of laying successes at the feet of his lady fair. It wasn't as if he and Carialle couldn't tell the difference between play and reality. The game had permeated their life and given it shape and texture, becoming more than a game, meaning more. He'd never tell this space-dry plodder about the time five years back that he actually stood vigil throughout a long, lonely night lit by a single candle to earn his knighthood. I guess you just had to be there, he thought. "If that's all?" he asked, standing up quickly. Darvi waved a stylus at him, already engrossed in the files. Keff escaped before the man thought of something else to ask and hurried down the curving hall to the nearest lift. Keff had learned about Myths and Legends in primary school. A gang of his friends used to get together once a week (more often when they dared and homework permitted) to play after class. Keff liked being able to live out some of his heroic fantasies and, briefly, be a knight battling evil and bringing good to all the world. As he grew up and learned that the galaxy was a billion times larger than his one small colony planet, the compulsion to do good grew, as did his private determination that he could make a difference, no matter how minute. He managed not to divulge this compulsion during his psychiatric interviews on his admission to Brawn Training and kept his altruism private. Nonetheless, as a knight of old, Keff performed his assigned tasks with energy and devotion, vowing that no ill or evil would ever be done by him. In a quiet way, he applied the rules of the game to his own life. As it happened, Carialle also loved M&L, but more for the strategy and research that went into formulating the quests than the adventuring. After they were paired, they had simply fallen into playing the game to while away the long days and months between stars. He could put no finger on a particular moment when they began to make it a lifestyle: Keff the eternal knight errant and Carialle his lady fair. To Keff this was the natural extension of an adolescent interest that had matured along with him. As soon as he'd heard that the CX-963 was in need of a brawn, his romantic nature required him to apply for the position as Carialle's brawn. He'd heardwho hadn't?about the devastating space storm and collision that had cost Fanine Takajima-Morrow's life and almost took Carialle's sanity. She'd had to undergo a long recovery period when the Mutant Minorities (MM) and Society for the Preservation of the Rights of Intelligent Minorities (SPRIM) boffins wondered if she'd ever be willing to go into space again. They rejoiced when she announced that not only was she ready to fly, but ready to interview brawns as well. Keff had wanted that assignment badly. Reading her file had given him an intense need to protect Carialle. A ridiculous notion, when he ruefully considered that she had the resources of a brainship at her synapse ends, but her vulnerability had been demonstrated during that storm. The protective aspect of his nature vibrated at the challenge to keep her from any further harm. Though she seldom talked about it, he suspected she still had nightmares about her ordealin those random hours when a brain might drop into dreamtime. She also proved to be the best of partners and companions. He liked her, her interests, her hobbies, didn't mind her faults or her tendency to be right more often than he was. She taught him patience. He taught her to swear in ninety languages as a creative means of dispelling tension. They bolstered one another. The trust between them was as deep as space and felt as ancient and as new at the same time. The fourteen years of their partnership had flown by, literally and figuratively. Within Keff's system of values, to be paired with a brainship was the greatest honor a mere human could be accorded, and he knew it. The lift slowed to a creaky halt and the doors opened. Keff had been on SSS-900 often enough to turn to port as he hit the corridor, in the direction of the spacer bar he liked to patronize while on station. Word had gotten around that he was back, probably the helpful Simeon's doing. A dark brown stout already separating from its creamy crown was waiting for him on the polished steel bar. It was the first thing on which he focused. "Ah!" he cried, moving toward the beer with both hands out. "Come to Keff." A hand reached into his field of vision and smartly slapped his wrist before he could touch the mug handle. Keff tilted a reproachful eye upward. "Hows your credit?" the bartender asked, then ripped him a wicked wink. She was a woman of his own age with nut-brown hair cut close to her head and the milk-fair skin of the lifelong spacer of European descent. "Just kidding. Drink up, Keff. This one's on the house. It's good to see you." "Blessings on you and on this establishment, Mariad, and on your brewers, wherever they are," Keff said, and put his nose into the foam and slowly tipped his head back and the glass up. The mug was empty when he set it down. "Ahhhh. Same again, please." Cheers and applause erupted from the tables and Keff waved in acknowledgment that his feat had been witnessed. A couple of people gave him thumbs up before returning to their conversations and dart games. "You can always tell a light-year spacer by the way he refuels in port," said one man, coming forward to clasp Keff's hand. His thin, melancholy face was contorted into an odd smile. Keff stood up and slapped him on the back. "Baran Larrimer! I didn't know you and Shelby were within a million light years of here." An old friend, Larrimer was half of a brain/brawn team assigned to the Central Worlds defense fleet. Keff suddenly remembered Simeon's briefing about naval support. Larrimer must have known exactly what Keff had been told. The older brawn gave him a tired grimace and nodded at the questioning expression on his face. "Got to keep our eyes open," he said simply. "And you are not keeping yours open," said a voice. A tiny arm slipped around Keff's waist and squeezed. He glanced down into a small, heart-shaped face. "Good to see you, Keff." "Susa Gren!" Keff lifted the young woman clean off the ground in a sweeping hug and set her down for a huge kiss, which she returned with interest. "So you and Marliban are here, too?" "Courier duty for a trading contingent," Susa said in a low voice, her dark eyes crinkling wryly at the corners. She tilted her head toward a group of hooded aliens sitting isolated around a table in the corner. "Hoping to sell Simeon a load of protector/detectors. They plain forgot that Marl's a brain and could hear every word. The things they said in front of him! Which he quite rightly passed straight on to Simeon, so, dear me, didn't they have a hard time bargaining their wares. I'd half a mind to tell CenCom that those idiots can find their own way home if they won't show a brainship more respect. But," she sighed, "it's paying work." Marl had only been in service for twono, it was three years nowand was still too far down in debt to Central Worlds for his shell and education to refuse assignments, especially ones that paid as well as first-class courier work. Susa owed megacredits, too. She had made herself responsible for the debts of her parents, who had borrowed heavily to make an independent go of it on a mining world, and had failed. Fortunately not fatally, but the disaster had left them with only a subsistence allowance. Keff liked the spunky young woman, admired her drive and wit, her springy step and dainty, attractive figure. The two of them had always had an affinity which Carialle had duly noted, commenting a trifle bluntly that the ideal playmate for a brawn was another brawn. Few others could understand the dedication a brawn had for his brainship nor match the lifelong relationship. "Susa," he said suddenly. "Do you have some time? Can you sit and talk for a while?" Her eyes twinkled as if she had read his mind. "I've nothing to do and nowhere to go. Marl and I have liberty until those drones want to go home. Buy me a drink?" Larrimer stood up, tactfully ignoring the increasing aura of intimacy between the other two brawns. He slapped his credit chit down on the bar and beckoned to Mariad. "Come by if you have a moment, Keff," he said. "Shelby would be glad to see you." "I will," Keff said, absently swatting a palm toward Larrimer's hand, which caught his in a firm clasp. "Safe going." He and Susa sat down together in a booth. Mariad delivered a pair of Guinnesses and, with a motherly cluck, sashayed away. "You're looking well," Susa said, scanning his face with a more than friendly concern. "You have a tan!" "I got it on our last planetfall," Keff said. "Hasn't had time to fade yet." "Well, I think you look good with a little color in your face," she declared. Her mouth crooked into a one-sided grin. "How far down does it go?" Keff waggled his eyebrows at her. "Maybe in a while I'll let you see." "Any of those deep scratches dangerous?" Carialle asked, swiveling an optical pickup out on a stalk to oversee the techs checking her outsides. The ship lay horizontally to the "dry dock" pier, giving the technicians the maximum expanse of hull to examine. "Most of 'em are no problem. I'm putting setpatch in the one nearest your fuel lines," the coveralled man said, spreading a gray goo over the place. It hardened slowly, acquiring a silver sheen that blended with the rest of the hull plates. "Don't think it'll split in temperature extremes, ma'am, but it's thinner there, of course. This'll protect you more." "Many thanks," Carialle said. When the patching compound dried, she tested her new skin for resonance and found its density matched well. In no time she'd forget she had a wrinkle under the dressing. Her audit program also found that the fee for materials was comfortingly low, compared to having the plate removed and hammered, or replaced entirely. Overhead, a spider-armed crane swung its burden over her bow, dropping snakelike hoses toward her open cargo hull. The crates of xeno material had already been taken away in a specially sealed container. A suited and hooded worker had already cleaned the nooks and niches, making sure no stray native spores had hooked a ride to the Central Worlds. The crane's operator directed the various flexible tubes to the appropriate valves. Fuel was first, and Carialle flipped open her fuel toggle as the stout hose reached it. The narrow tube which fed her protein vats had a numbered filter at its spigot end. Carialle recorded that number in her files in case there were any impurities in the final product. Thankfully, the conduit that fed the carbo-protein sludge to Keff's food synthesizer was opaque. The peristaltic pulse of the thick stuff always made Cari think of quicksand, of sand-colored octopi creeping along an ocean floor, of week-old oatmeal. Her attention diverted momentarily to the dock, where a front-end loader was rolling toward her with a couple of containers, one large and one small, with bar-code tags addressed to Keff. She signaled her okay to the driver to load them in her cargo bay. Another tech, a short, stout woman wearing thick-soled magnetic boots, approached her airlock and held up a small item. "This is for you from the station-master, Carialle. Permission to come aboard?" Carialle focused on the datahedron in her fingers and felt a twitch of curiosity. "Permission granted," she said. The tech clanked her way into the airlock and turned sideways to match the up/down orientation of Carialle's decks, then marched carefully toward the main cabin. "Did he say what it was?" "No, ma'am. It's a surprise." "Oh, Simeon!" Carialle exclaimed over the station-master's private channel. "Cats! Thank you!" She scanned the contents of the hedron back and forth. "Almost a realtime week of video footage. Wherever did you get it?" "From a biologist who breeds domestic felines. He was out here two months ago. The hedron contains compressed videos of his cats and kittens, and he threw in some videos of wild felines he took on a couple of the colony worlds. Thought you'd like it." "Simeon, it's wonderful. What can I swap you for it?" The station-masters voice was sheepish. "You don't need to swap, Cari, but if you happened to have a spare painting? And I'm quite willing to sweeten the swap." "Oh, no. I'd be cheating you. It isn't as if they're music. They're nothing." "That isn't true, and you know it. You're a brain's artist." With little reluctance, Carialle let Simeon tap into her video systems and directed him to the corner of the main cabin where her painting gear was stowed. To any planetbound home-owner the cabin looked spotless, but to another spacer, it was a magpies' nest. Keff's exercise equipment occupied much of one end of the cabin. At the other, Carialle's specially adapted rack of painting equipment took up a largish section of floor space, not to mention wall space where her finished work hungthe ones she didn't give away or throw away. Those few permitted to see Carl's paintings were apt to call them "masterpieces," but she disclaimed that. Not having a softshell body with hands to manage the mechanics of the art, she had had customized gear built to achieve the desired effect. The canvases she used were very thin, porous blocks of cells that she could flood individually with paint, like pixels on a computer screen, until it oozed together. The results almost resembled brush strokes. With the advance of technological subtleties, partly thanks to Moto-Prosthetics, Carialle had designed arms that could hold actual fiber brushes and airbrushes, to apply paints to the surface of the canvases over the base work. What had started as therapy after her narrow escape from death had become a successful and rewarding hobby. An occasional sale of a picture helped to fill the larder or the fuel tank when bonuses were scarce, and the odd gift of an unlooked-for screen-canvas did much to placate occasionally fratchety bureaucrats. The sophisticated servo arms pulled one microfiber canvas after another out of the enameled, cabinet-mounted rack to show Simeon, who appreciated all and made sensible comments about several. "That one's available," Carialle said, mechanical hands turning over a night-black spacescape, a full-color sketch of a small nocturnal animal, and a study of a crystalline mineral deposit embedded in a meteor. "This one I gave Keff. This one I'm keeping. This one's not finished. Hmm. These two are available. So's this one." Much of what Carialle rendered wouldn't be visible to the unenhanced eyes of a softshell artist, but the sensory apparatus available to a shellperson gave color and light to scenes that would otherwise seem to the naked eye to be only black with white pinpoints of stars. "That's good." Simeon directed her camera to a spacescape of a battered scout ship traveling against the distant cloudlike mist of an ion storm that partially overlaid the corona of a star like a veil. The canvas itself wasn't rectangular in shape, but had a gentle irregular outline that complimented the subject. "Um," Carialle said. Her eye, on tight microscopic adjustment, picked up flaws in some individual cells of paint. They were red instead of carmine, and the shading wasn't subtle enough. "Its not finished yet." "You mean you're not through fiddling with it. Give over, girl. I like it." "It's yours, then," Carialle said with an audible sigh of resignation. The servo picked it out of the rack and headed for the airlock on its small track-treads. Carialle activated a camera on the outside of her hull to spot a technician in the landing bay. "Barkley, would you mind taking something for the station-master?" she said, putting her voice on speaker. "Sure wouldn't, Carialle," the mech-tech said, with a brilliant smile at the visible camera. The servo met her edge of the dock, and handed the painting to her. "You've got talent, gal," Simeon said, still sharing her video system as she watched the tech leave the bay. "Thank you. I'll treasure it." "Its nothing," Carialle said modestly. "Just a hobby." "Fardles. Say, I've got a good idea. Why don't you do a gallery showing next time you're in port? We have plenty of traders and bigwigs coming through who would pay good credit for original art. Not to mention the added cachet that it's painted by a brainship." "We-ell . . ." Carialle said, considering. "I'll give you free space near the concessions for the first week, so you're not losing anything on the cost of location. If you feel shy about showing off, you can do it by invitation only, but I warn you, word will spread." "You've persuaded me," Carialle said. "My intentions are purely honorable," Simeon replied gallantly. "Frag it!" he exclaimed. The speed of transmission on his frequency increased to a microsquirt. "You're as loaded and ready as you're going to get, Carialle. Put it together and scram off this station. The Inspector General wants a meeting with you in fifteen minutes. He just told me to route a message through to you. I'm delaying it as long as I dare." "Oh, no!" Carialle said at the same speed. "I have no intention of letting Dr. Sennet 'I am a psychologist' Maxwell-Corey pick through my brains every single fardling time I make stationfall. I'm cured, damn it! I don't need constant monitoring." "You'd better scoot now, Cari. My walls-with-ears have heard rumors that he thinks your 'obsession' with things like Myths and Legends makes your sanity highly suspect. When he hears the latest reportyour Beasts Blatisantyou're going to be in for another long psychological profile session, and Keff along with you. Even Maxwell-Corey has to justify his job to someone." "Damn him! We haven't finished loading my supplies! I only have half a vat of nutrients, and most of the stuff Keff ordered is still in your stores." "Sorry, honey. It'll still be here when you come back. I can send you a squirt after he's gone." Carialle considered swiftly whether it was worth calling in a complaint to SPRIM over the Inspector General and his obsessive desire to prove her unfit for service. He was witch-hunting, of that she was sure, and she wasn't going to be the witch involved. Wasn't it bad enough that he insisted on making her relive a sixteen-year-old tragedy every time they met? One day there was going to be a big battle, but she didn't feel like taking him on yet. Simeon was right. The CK-963 was through with decontamination and repairs. Only half a second had passed during their conversation. Simeon could hold up the IG's missive only a few minutes before the delay would cause the obstreperous Maxwell-Corey to demand an inquiry. "Open up for me, Simeon. I've got to find Keff." "No problem," the station-master said. "I know where he went." "Keff," said the wall over his head. "Emergency transmission from Carialle." Keff tilted his head up lazily. "I'm busy, Simeon. Privacy." Susa's hand reached up, tangled in his hair, and pulled it down again. He breathed in the young woman's scent, moved his hands in delightful counterpoint under her body, one down from the curve of her shoulder, pushing the thin cloth of her ship-suit down; one upward, caressing her buttocks and delicate waist. She locked her legs with his, started her free hand toward his waistband, feeling for the fastening. "Emergency priority transmission from Carialle," Simeon repeated. Reluctantly, Keff unlocked his lips from Susa's. Her eyes filled with concern, she nodded. Without moving his head, he said, "All right, Simeon. Put it through." "Keff," Carialle's voice rang with agitation. "Get down here immediately. We've got to lift ship ASAP." "Why?" Keff asked irritably. "You couldn't have finished loading already." "Haven't. Can't wait. Got to go. Get here, stat!" Sighing, Keff rolled off Susa and petulantly addressed the ceiling. "What about my shore leave? Ladylove, while I like nothing better in the galaxy than being with you ninety-nine percent of the time, there is that one percent when we poor shell-less ones need"
Carialle cut him off. "Keff, the Inspector General's on station." "He's demanding another meeting, and you know what that means. We've got to get as far away from here as we can, right away." Keff was already struggling back into his ship-suit. "Are we refueled? How much supplies are on board?" Simeon's voice issued from the concealed speaker. "About a third full," he said. "But it's all I can give you right now. I told you supplies were short. Your food's about the same." "We can't go far on that. About one long run, or two short ones." Keff stood, jamming feet into boots. Susa sat up and began pulling the top of her coverall over her bare shoulders. She shot Keff a look of regret mingled with understanding. "We'll get missing supplies elsewhere," Carialle promised. "What's the safest vector out of here, Simeon?" "I'll leave," Susa said, rising from the edge of the bed. She put a delicate hand on his arm. Keff stooped down and kissed her. "The less I hear, the less I have to confess if someone asks me under oath. Safe going, you two." She gave Keff a longing glance under her dark lashes. "Next time." Just like that, she was gone, no complaints, no recriminations. Keff admired her for that As usual, Carialle was correct: a brawn's ideal playmate was another brawn. It didn't stop him feeling frustrated over his thwarted sexual encounter, but it was better to spend that energy in a useful manner. Hopping into his right boot, he hurried out into the corridor. Ahead of him, Susa headed for a lift. Keff deliberately turned around, seeking a different route to his ship. "Keep me out of Maxwell-Corey's way, Simeon." He ran around the curve of the station until he came to another lift. He punched the button, pacing anxiously until the doors opened. "You're okay on that path," the station-master said, his voice following Keff. The brawn stepped into the empty car, and the doors slid shut behind him. "All right, this just became an express. Brace yourself." "What about G sector?" Carialle was asking as Keff came aboard the CK-963. All the screens in the main cabin were full of star charts. Keff nodded Carialle's position in the main column and threw himself into his crash couch as he started going down the pre-launch list. "Okay if you don't head toward Saffron. That's where the Fleet ships last traced Belazir's people. You don't want to meet them." "Fragging well right we don't." "What about M sector?" Keff said, peering at the chart directly in front of him. "We had good luck there last time." "Last time you had your clock cleaned by the Losels," Carialle reminded him, not in too much of a hurry to tease. "You call that good luck?" "There're still a few systems in that area we wanted to check. They fitted the profile for supporting complex life-forms," Keff said, unperturbed. "We would have tried MBA-487-J, except you ran short of fuel hotdogging it and we had to limp back here. Remember, Cari?" "It could happen any time we run into bad luck," Carialle replied, not eager to discuss her own mistakes. "We're running out of time." "What about vectoring up over the Central Worlds cluster? Toward galactic 'up'?" "Maxwell-Corey's going toward DND-922-Z when he leaves here," Simeon said. Carialle tsk-tsked. "We can't risk having him following our scent." Keff stared at the overview on the tank. "How about we head out in a completely new direction? See what's out there thataway?" "What's your advice, Simeon?" Carialle asked, locking down any loose items and sliding her airlock shut with a sharp hiss. Her gauges zoomed as she engaged her own power. Nutrients, fuel, power cells all showed less than half full. She hated lifting off under these circumstances, but she had no choice. The alternative was weeks of interrogation, and possibly being groundedunfairly!at the end of it. "I've got an interesting anomaly you might investigate," Simeon said, downloading a file to Carialle's memory. "Here's a report I received from a freighter captain who made a jump through R sector to get here. His spectroscopes picked up unusual power emanations in the vicinity of RNJ-599-B. We've no records of habitation anywhere around there. Could be interesting." "G-type stars," Keff noted approvingly. "Yes, I see what he meant. Spectroanalysis, Cari?" "All the signs are there that RNJ could have generated planets," the brain replied. "What does Exploration say?" "No one's done any investigation in that part of R sector yet," Simeon said blandly, carefully emotionless. "No one?" Carialle asked, scrolling through the files. "Hmmm! Oh, yes!" "So we'll be the first?" Keff said, catching the excitement in Carialle's voice. The burning desire to go somewhere and see something first, before any other Central Worlder, overrode the fears of being caught by the Inspector General. "I can't locate any reference to so much as a robot drone," Carialle said, displaying star maps empty of neon-colored benchmarks or route vectors. Keff beamed. "And to seek out new worlds, to boldly go . . ."
"Oh, shush," Carialle said severely. "You just want to be the first to leave your footprints in the sand." "You've got twelve seconds to company," Simeon said. "Don't tell me where you're going. What I don't know I can't lie about. Go with my blessings, and come back safely. Soon." "Will do," Keff said, strapping in. "Thanks for everything, Simeon. Cari, ready to"
The words were hardly out of his mouth before the CK-963 unlatched the docking ring and lit portside thrusters.